Watch frenchman Guillaume Néry take a freedive into the world's largest bluewater sinkhole. “The most magical moment is when I escape gravity. It is liberation. It is breaking loose. I fly with my arms open. At those moments I am completely calm. Everything around me becomes one and I become part of that whole,” he tells this month's Red Bulletin. 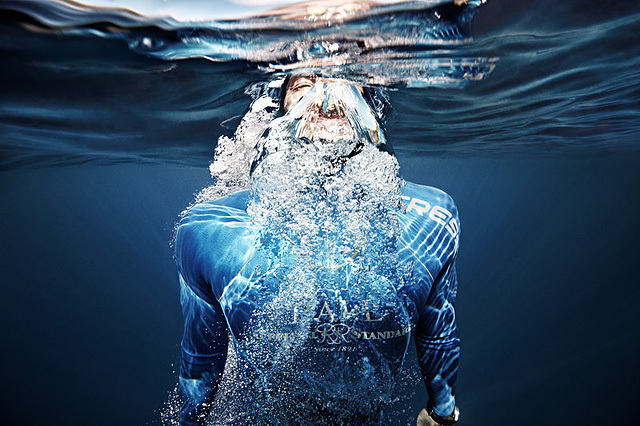 Freediving is a natural expression for his childhood ambition – he wanted to go into space. “When I was a kid, I dreamed of becoming an astronaut and was constantly looking up at the sky,” he says. Soon the Frenchman was practising holding his breath and diving at every opportunity to become one of the best in the world. His particular discipline is 'Constant Weight' where divers descend and ascend a line with just a monofin for assistance.